Snap(shot) Judgements are posts that will appear with no real regularity. It’s primarily a way for us to get thoughts and photos up as soon as possible, especially when we have no plan to write a feature-length column on the subject. Here, Gary works his way through the crowd at the Grub Street Food Festival in order to sample some of the delicious wares on display. A few weeks back, the Hester Street Fair was the site for the first-ever Grub Street Food Festival, a block party in which 40 vendors brought plenty of food to be sold. And, boy, did the food sell – when I got there a little before 2 pm, there were already a few vendors there that had gone through all their food for the day, with more than four hours to go. That didn’t stop people from showing up by the F trainload, filling the tiny space up to a claustrophobic capacity – if we were indoors, it’d be a fire hazard. The lines for the stands were a mess – you couldn’t tell what some of the longer lines were for and if they extended past their stand to a less popular one, you could easily think that the line was for them, thus denying the less popular stand some business. 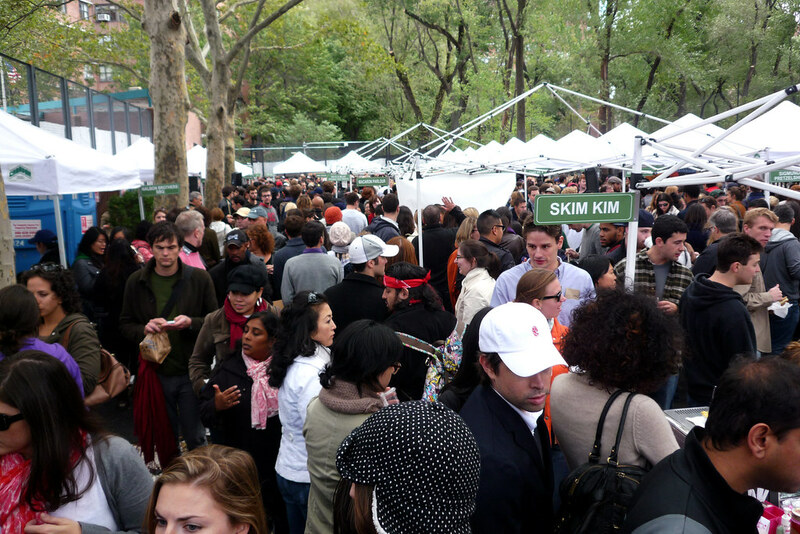 A note to Grub Street if they do this again – maybe a bigger location like Brooklyn Flea? Still, I managed to make my way to a few vendors and snacked on some tasty treats.